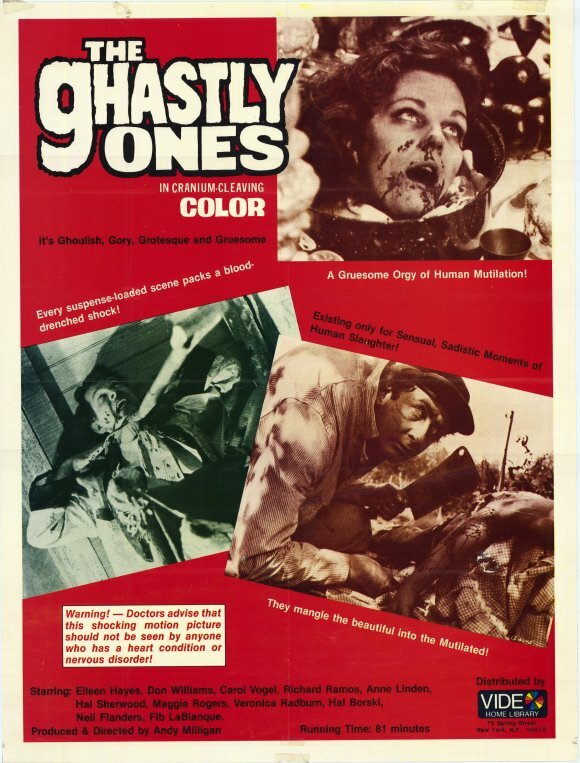 The Ghastly Ones Review (1968) aka Blood Rites. 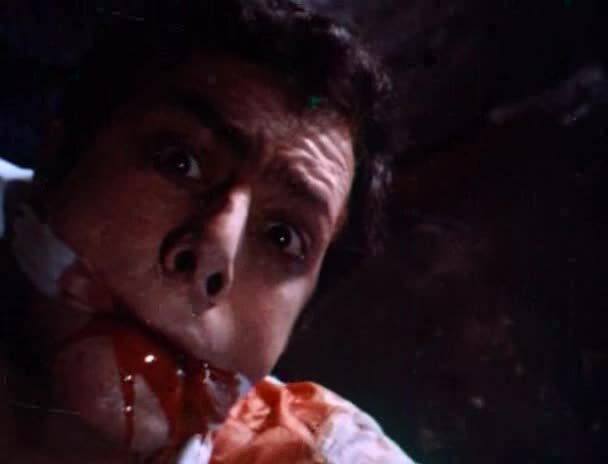 Andy Milligan’s trash movie which got banned in the UK… – Stigmatophilia's gore splattered corner of insanity. Hilarity abounds in this 1968 ‘what the hell did I just watch?’ schlockfest which was banned as a video nasty in the UK under the title Blood Rites. This film earned director Andy Milligan the title of one of the worst filmmakers of all time and it is not surprising. Shot on a 16mm World War II handheld camera, Milligan will not win any prizes for artistic merit for this grotty little flick, which incidentally was his first venture as a full length horror feature, however it is down right hilarious and worth picking up on this basis alone. Shot on Milligan’s home stomping ground of Staten Island on the smallest shoestring The Ghastly Ones takes the term low-budget to new levels. Apparently the original running time hardly racked up an hour until producers ordered an extended scene to be added in (which we see in the opening of the movie) which Milligan was not happy about, as it also adds confusion into this already slightly bizarre and convoluted plot. A group of three sisters and their husbands are summoned to a reading of their father’s will and it is requested that they spend three days at his old house before they can get their hands on their inheritance. He also makes strange assertions to his late wife’s frigidity and states he would like his daughters to enjoy pleasures of the flesh during their stay as the house has not known this sort of passion. A boat will arrive on the morning of the last day containing the father’s lawyer who will divide up the proceeds. 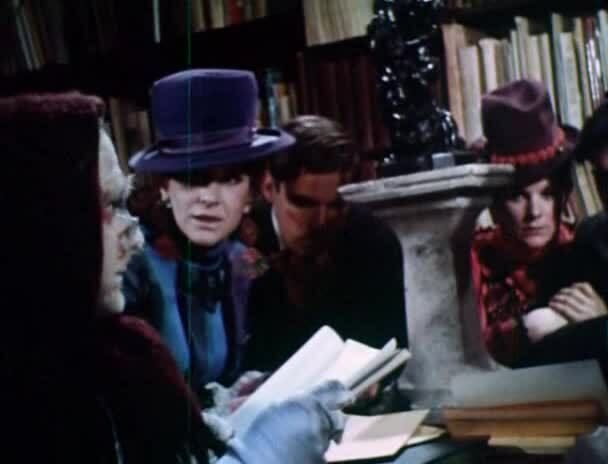 The daughters agree and depart straight away to the house, which is in a remote island location, and find that the house comes with a staff of three, Martha, Hattie and hunchbacked idiot Colin (Hal Borske) . Who will inherit the money becomes uncertain however when people start to get mysteriously bumped off in the night. In terms of casting if you listen to the audio commentary on the Something Weird release it becomes apparent that Milligan grabbed hold of any hard up actor in his locality to feature in this film. The commentary by Hal Borske actually makes this film because it gives a rare insight into the seedy world of 60s low-budget filmmaking and proves immensely entertaining. On the smallest budget (so small in fact that when the extended scene was shot you will notice Colin isn’t wearing his goofy teeth because they were lost and they could not afford a replacement) actors earned a pittance for appearing in this and Hal had to earn extra cash by typing up the scripts for Milligan. Borske as Colin is just amazing in a camp and no holes barred mentalist sort of way, complete with awful goofy teeth, and a hunch which he declared was a blessing because it saved him from injury during his beating scenes. My favourite though had to be Maggie Rogers as Hattie who was fantastic as the hard faced and slightly sinister maid. I also have to mention Neil Flanagan as the family lawyer, what the hell they were thinking sticking random pieces of hair up his nostrils and out of his ears God only knows but it amplified the farce elements in this flick to brilliant effect. Apparently Milligan had a special hatred toward Priests and religion in general and would often cast some sort of messed up religious character, and The Ghastly Ones has its own example of this in the form of Hal Sherwood as strange and slightly pervy pastor Walter. For the rest of the cast they all looked like they were having a bloody good time really and for the first half they look like they are finding it hard to keep a straight face. Pacing in this picture is a bit hit and miss, for the first three quarters nothing much seems to really happen. We have the extended sequence put in at the beginning which has little relevance to the plot, then a series of odd scenes as the family members meet with the lawyer, travel to the house, and then the action finally starts to get going. While there is an obvious attempt to add shock factor gore effects here it is severely hampered by two things. Firstly the print is so awful, complete with green lines, that it actually looks like they have stepped into that computer on The Matrix at one point, and some of the shots are so dark you cannot see what is going on. Secondly there are some moments of sheer comedy which detract from any seriousness, which In my opinion enhanced the entertainment factor in watching this. Had it been made as a straight up, serious, horror, then I might not have liked it ( I don’t know maybe it was? but it certainly did not come off that way). One of my personal high points is when one of the characters is hunting around in a darkened basement the killer is literally crouched down behind him in plain view, like in a pantomime, you just want to shout out ‘he’s behind you!!’. The frugality employed to make this movie is outstanding. Cheap cameras, cheap film, low paid actors, they even had to recycle some of the meat used in the effects as dinner because they were so poor. But Hal talks about the making of this with great affection in his commentary, they may not have had money or fame but they seemed to have a blast making it, even if Milligan was at times difficult to work with. 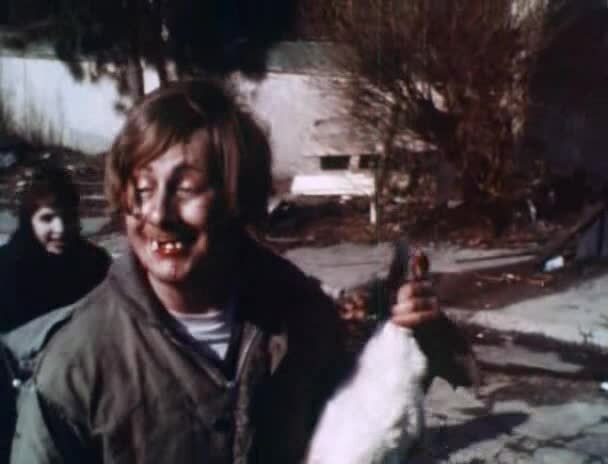 You have to feel sorry for the actors, Hal admitting the rabbit eating scene was every bit as repulsive as it looks as the prop used was an actual dead rabbit in some advanced stage of decomposure, which he had to literally get his teeth into. There are too many moments of high farce in this film to list. Instead if you do decide to check it out I will leave you to discover them all on your own but from bizarre and inexplicable sequences, odd characters, weird choice of costumes, and questionable acting, all this amounts to is an amazing example of drive-in shlock that is so bad its good. I have to admit I loved the Ghastly Ones, it was camp-o-rama, cheap and cheesy, all the elements I love in this sort of retro flick. Poor filmmaking at its very best. This will not be everyone’s cup of tea, but if you are looking for some fun for a Sunday afternoon to while away an hour, or something to have a laugh over while having a few beers this is perfect. It won’t challenge you in any way, but then with a title like ‘The Ghastly Ones’ exactly what do you expect? ‹ Parents Review (1989). Randy Quaid as you have never seen him before as a cannibal?